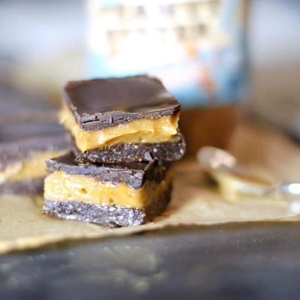 Quick and easy bars that taste like your favorite chocolate peanut butter cups! Line a standard loaf pan with parchment paper and set it aside. In a medium bowl, stir together all of the chocolate crust ingredients until a moist dough is formed. Press the dough evenly into the bottom of the lined loaf pan, and place it in the freezer to set. To prepare the filling, you can use the same bowl to stir together the peanut butter, maple syrup, coconut oil and salt. Depending on whether you're using salted or unsalted peanut butter, you may want to add more salt to taste. Store-bought peanut butter cups are quite salty, so I like to add a generous pinch of salt to mimic that flavor. Remove the crust from the freezer and pour the peanut butter filling over the top, using a spatula to spread it out evenly. Return the pan to the freezer to set. Rinse the mixing bowl, and use it again, if you like, to make the final layer. Combine the cocoa powder, melted coconut oil, and maple syrup, whisking well to break up any clumps. Once the mixture has become a smooth chocolate sauce, pour it over the peanut butter layer, and return the pan to the freezer to set until firm, about an hour or two.